BlogHome » Blog » Help & Support » Why Self-Awareness? Self Awareness is when your present moment awareness allows you to recognize your personality, physical state and who you’re being in any moment. It includes being conscious of things like your thoughts, [limiting] beliefs, energetic state (vibration), physical conditions and emotions. Self Awareness is the key to powerfully charting a course for the direction of your life instead of being mindless or reacting to the world around you. When you’re self-aware you understand how the experience of life (aka the results – people and stuff) are an effect of the cause of what you have going on inside. Today’s one of those days for me when my self-awareness feels like part blessing and part curse. Looking back at all the years I was bulimic I would have given anything to have been free of the ridiculous-ness I put myself through because of my eating disorder. Nonetheless, I did a ton of sad things to myself, to my relationships and wasted a lot of my life because I allowed my addiction to run the show. I felt like a machine that could never change the routine and had to keep living with the same painful results over and over and over. When I learned about self-awareness and began strengthening my muscle around present moment awareness I thought it was such a blessing. Today, I’m having a funk-y day where I have a ton of self-awareness, but it’s not yet helping the situation any. Well, sort of. Right now in the midst of some negative feelings and self-doubt. It feels like struggle, angst, frustration and not being good enough. I know this will pass, but I’ve been in the “muck” of my limiting beliefs all day and am pretty flustered that they’re sticking around. Even though I walk the spiritual journey and am blessed to be living without bulimia, I am still a human being having real experiences. I used to think that if I could just take one more course or one more book would “cure” me of this way of thinking that gets me off on a negative tangent that I’d be happy. What I’ve come to realize is that I have a lot of life ahead of me. The road is going to have twists and turns and potholes from time to time that I’ll either cruise over or allow myself to get stuck in for awhile. Where I am with my potholes is that they are just going to be there from time to time and I don’t have to get stuck in them. My powerful practices has taught me that I am much bigger than any problem. I can get back up and keep plugging along. My journey is filled with lessons to teach me. If I get the lesson at this leg of my journey, the pot hole won’t turn into a mass accident down the road. That’s my choice if I’m aware of it. I also have learned that the sooner I get present to what I’m feeling, why I’m feeling it and what I want to feel instead the faster I’ll be able to move ahead. Staying with bad feelings and negative energy doesn’t serve me for long. It is a teacher and I welcome to opportunity for inner reflection and growth, but I’m here to have a good time. I’m here to joyously romp and play in my life; not sit in a ditch on the side of the road waiting for a ride. Part of my bulimia help program called Spiritual Warrior Group Mentoring is teaching people to become self-aware. It is a practice that you can learn and master. Think of learning to be self aware like learning to dance. When we learn to dance we pay attention to the movement of our feet, what to do with our hands, and what our partner is doing. We listen to the beats of the music, we’re aware of the other dancers on the floor and the space around us, too. The Tango isn’t learned by reading books and self-awareness isn’t either. I have discovered many useful techniques that accelerate the learning. I have incorporated these techniques into my Spiritual Warrior Mentoring Program. 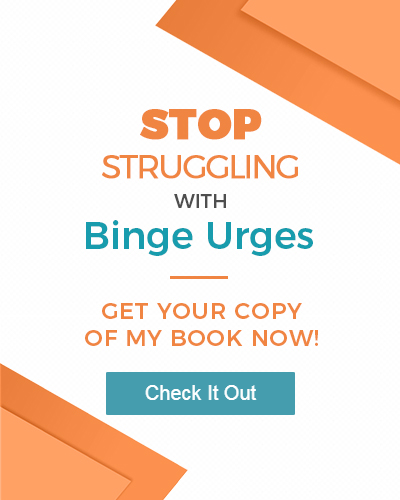 If you’d like to learn self-awareness to overcome bulimia, I look forward to sharing what I’ve learned with you. I Relapsed. Now I Feel Like a Failure.